Today we're talking to the AWESOME Natalie Meisner who ROCKS her son's hat. Her story, Double Pregnant, is based on her life. You can read more about Natalie, her wife, and their sons at The Calgary Herald which did a really cool cover story. Hello Natalie and welcome to The Hat Party <3 Thank you so much for subjecting yourself to the RANDOMNESS that is a Raine O'Tierney interview! Please don your best hat, and let's get started! Explain your style in 7 1/2 words. Give a shout-out to another author who may, or may not, know how much you appreciate them. Kate Millet: A Pioneer, Formidable Intellect, and the founder of the Art Farm: A place for women artists in upstate New York. I went there as a young writer and she was an excellent mentor and an inspiration. Have you ever tried collaborating? Why or why not? Yes, I am a beast for it. Writing for Theatre is like writing an exquisite blueprint for a building that others construct… Love it, love it, love it! Also working with an editor on a book. Such an engaged and intellectually intimate process. You can go back to any point in your life to give you past self a pep-talk. How old is your past self and what do you say? What is your super secret, wildest, most outlandish writing dream? Could I please, please, please ghost write Oprah’s Tell All Memoir. Please, with sugar on top? In our beach house on the lip of the Atlantic we have a year to love, feed, bathe, read to and play with our babies. We eat fresh seafood and push the stroller along the beach, fresh salty air filling their new lungs. Life distilled to its most basic: food, water, rest, and love. Just as we have settled into a comfortable routine, my wife points to the concrete pilings down on the waterline. “I would like to get started soon” she says, and I know there is no changing her mind. Plans to put up a woodshed have escalated into an outbuilding/guesthouse. And this is why I am breastfeeding one baby and rocking the other to sleep with my foot while my wife, six weeks to the day from bringing our son into the world, frames up beams for a new building. She has two great guys working with her, friends who don’t even blink when I bring our youngest son out for his feeding time. “The boy would like a word,” I say. “I just want to finish this last beam,” says Viviën from the ladder, but our son registers his impatience with a hearty howl. “He won’t take no for an answer,” I say, and she descends. No matter how long we live on this planet this snapshot shall remain: Vivien’s strong arms cradling our son as she feeds him, the Atlantic a piercing blue behind her, and her eyes glinting with the excitement of a new project. You’re writing along and you’re attacked by a horde of zombies…ON FIRE…how do you survive? Or do you become a zombie too? Tap dance while doing jazz hands. It is a little known fact, but Zombies are repelled by such activities. If you do both simultaneously, they will slide right by you like a fried egg off a new Teflon pan and eat the brains of someone further on. Your thoughts on libraries: GO! My second home. My happy place. Where I would live, permanently if society didn’t frown so heavily upon it. Be totally honest. How awesome would you be at leading a moon colony? I think I would start out well with inspirational messages and great pep talks. I would fall down later, when practical things set in… like how to extract that frozen water from the moon dust… once the cannibalism set in, I would be pretty done. And finally, for THE most important question of all: what kinds of dachshunds are the BEST kinds of dachshunds? There’s more than one kind? Okay, don’t hate me, here’s some bonus Dachshund content. A friend just told me that Dachshund means BADGER HUNTER and that they needed to be close to the ground to hunt them. This impressed me because we all know about how vicious badgers (honey or otherwise) can be. Girl meets girl. Girl marries girl. 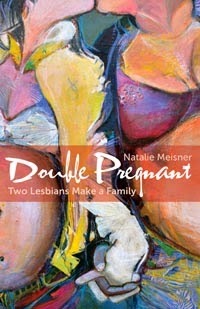 They want to have babies…but they need a little help.Double Pregnant is author Natalie Meisner’s light-hearted, poignant and informative true story about starting a family with her wife Viviën. Because Viviën is a woman of colour who was adopted into a white family, the couple wants their children to have a connection to their donor and decide against taking the anonymous, sperm clinic route. But they realize they are going to need some help. Taking matters into their own hands leads the couple to a series of often-hilarious “dates” with potential donors, all of whom have wildly different opinions on how the donation process should go, and how Natalie and Viviën should proceed as a new family. The next time we emerge into the fresh air our little family is complete. Two mums and two beautiful baby boys. Viviën is mending in record time. The incision that brought our second son into the world is a barely visible line on the way to disappearing. The bump on the baby’s head is nearly gone, and hour-by-hour he seems more at ease. It is quite a production loading everything and everybody into the car as we leave the hospital, but we have lots of help from my mother, my aunt and one of our favourite nurses. Our dog Rockit is in the car as we pack up and get the car seats in place. His eyes register some disbelief that we are bringing another one of those small noisy people home, but he takes it with good will. We pull out of the parking lot, and the hospital (a world onto itself) fades in the rearview. As I pilot my precious cargo along the ninety minutes of winding shoreline road back to Lockeport, I feel suddenly the weight of responsibility, not just for getting them all home safely, but for taking care of all of them — wife, sons, and puppy — to varying degrees for the rest of my life. I feel ready to give it my all every single day. In our little summer house on the southernmost tip of Nova Scotia on the lip of the Atlantic we have the rest of the year to love, feed, bathe, read to, teach, learn from, and play with our babies. We eat fresh seafood and push the stroller along the beach over lumps of seaweed, fresh salty air filling those new little lungs. Life again returns to its most basic: food, water, rest, and love. Some evenings when we put them down to sleep, we resort to peanut butter sandwiches for supper, but we eat them together, happily, with our feet up, pleased with what we have accomplished. Just as this zen-like state has returned and the late spring sun bouncing off the water is lulling me into a comfortable routine, Viviën begins staring out the window at the concrete pilings down on the waterline. “I would like to get started soon” is all she says, and knowing her as I do, I understand that there is really no point in trying to change her mind. In fact, by the end of the afternoon, our plans to put up a little woodshed have escalated into a full-on extra building complete with hardwood and tile interior that will serve as a small guesthouse/office. And this is how it is that I find myself in the house, breastfeeding one baby and rocking the other to sleep with my foot while Viviën, six weeks to the day from the moment she brought our son into the world, frames up beams for the new building. She has a team of two great guys working with her: my cousin and another hardworking guy with a sunny disposition on a work exchange from the U.K. They know us a little bit by now and don’t even blink when I bring our youngest son out for his feeding time. “The boy would like a word,” I say. “I’m coming. I just want to finish this last beam,” says Viviën from the ladder, around a couple nails she has squeezed between her lips. Our son registers his impatience with a hearty howl, waving his two little fists in the air. “He really won’t take no for an answer,” I say. She comes down from the ladder, and the fellows laugh as they put down their tools. They come and sit on the step to sip a cold beer and eat the sandwiches I made for them. No matter how long we live on this planet and how many changes we go through together, I shall always carry this snapshot of Viviën close to my heart: her strong arms cradling our son as she feeds him, the Atlantic a piercing blue behind her, sawdust resting lightly on her hair and arms, and her eyes glinting with the excitement of a new project. What inspired you to write Double Pregnant? When my wife and I decided to try and have babies, I went looking for books about GLBTIQ parenting and there were very, very few… especially in Canada. So I tried to write a book that I would want to read. Is there anything special you’d like us to know about your book? So many hilarious things happened to us while we were looking for a sperm donor… I just thought my life has just gotten so strange that I couldn’t make this up if I tried… so at that moment I figured I should cross over (if only temporarily) to non-fiction. What are your hopes for this title? I hope it uses a kind of gentle humor to open doors and forge connections. One thing I learned during all this is how much kinship I had with every other person struggling with infertility or for their full rights to live and love as they desire. Don't Miss a Single Interview or Giveaway! 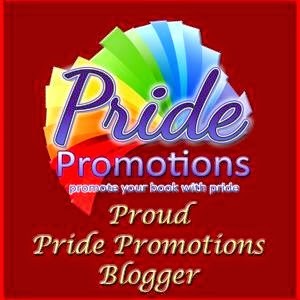 Raine O'Tierney is an M/M romance author who loves celebrating other authors, asking probing questions about dachshunds, and generally supporting the creative process! Plus she thinks hats are worth throwing a party over! INTERVIEW: Sarah Madison plus #Giveaway! INTERVIEW: Jonathan Treadway plus #Giveaway! INTERVIEW: Sandra Bard and #Giveaway! INTERVIEW: Silvia Violet and #Giveaway! INTERVIEW: Suki Fleet and #Giveaway! 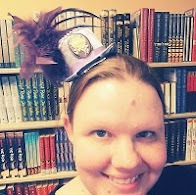 INTERVIEW: Elizabeth Noble and #Giveaway! INTERVIEW: Max Vos and #Giveaway! INTERVIEW: Angel Martinez and #Giveaway! Copyright © 2014 Raine O'Tierney.. Awesome Inc. theme. Powered by Blogger.